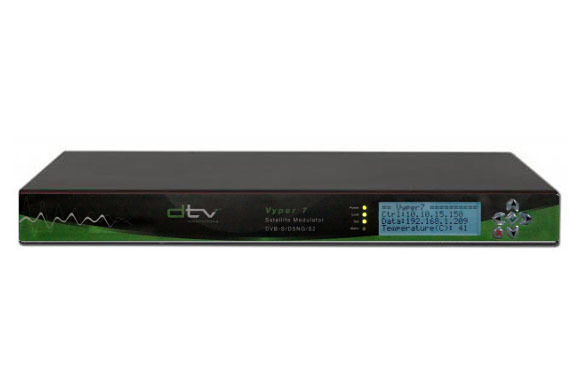 The Vyper 7 is a state-of-the-art standards based satellite modulator producing a modulated carrier in full compliance with the DVB-S, DVB-DSNG, DVB-S2 and, when appropriately licensed, DVB-S2x (broadcast and DSNG profiles) standards. The Vyper 7 will support data rates from .25 Mbps to 200 Mbps and symbol rates of 0.1 to 68 Mbaud (ie 72 MHz with a roll off of 5%). With its available bit rates, MODCODs, flexible inputs and outputs, you’ll never find yourself wanting with the Vyper 7 DVB modulator. Provided that the rest of your outside broadcast van or satellite uplink truck is up to it, you’ll be able to support a premier sporting event, requiring the transmission of a high data rate multiplex and advanced modulation, just as easily as a local television news broadcast using 8PSK modulation and a fraction of a satellite transponder. Although ASI has long been the standard output for most broadcast video encoders, the industry is slowly standardizing on IP for many reasons. The Vyper 7 supports both ASI and TSoIP on Ethernet inputs to ensure that your investment will continue to provide a return no mater which encoders you decide to purchase in the future. The Vyper 7 is idea for Satellite Sports Contribution, Satellite News Contribution, and Multiplexed Video Contribution including applications requiring the use of a full satellite transponder. The Vyper 7 provides a user-friendly embedded web browser enabling full configuration of the modulator without the need to be physically located with the unit. Input signal management, selection of DVB-S, DVB-S2, and DVB-S2X, MODCOD and control of the RF output mute/unmute function can all be controlled via a web browser. The GUI also offers monitoring of the input stream format and bit rate.